1. Read the pattern all the way through before beginning. 2. When changing color complete the last stitch of the round with the new color. Work in the ends as you go. See instructions for the way I handle color changes at bottom of instructions. 3. For the sleep sack in the photograph I used Red Heart Super Saver Peruvian Print and Turqua. 4. Actual measurements 30 inch circumference and 22 inch length. To make longer repeat round 10 until desired length. Dc dec over 3 (decrease) = Yo and draw up a loop in next st, yo and draw through 2 loops, skip next sts, yo and draw up a loop in next st, yo and draw through 2 loops, yo and draw through all 3 loops on hook. Sc dec over 3 (decrease) = Draw up a loop in next st, skip next dc, draw up a loop in next st, yo and draw through all 3 loops on hook. Sc dec (decrease) = Draw up a loop in next st, draw up a loop in next st, yo and draw through all 3 loops on hook. On rounds 7-9 first sc goes in same st as join. Measure sleep sack, if it isn’t between 21 and 22 inches, work round again. Round 33: Slipstitch in next st, ch 1, sc in same stitch and next 4 sts. *Sc, ch 2, sc in next st, sc in 5 sts, sc dec over 3 sts, sc in 5 sts. Repeat from * around. End round with sc, ch 2, sc in next st, sc in 5 sts, sc dec over 3 sts. Do not join, fasten off and use the tapestry needle to join and weave in end. What I do is; cut the yarn leaving a tail about 4 inches long. Then I join the new color yarn by completing the last pull through of the stitch with the new yarn. I work about 10 stitches, turn my work over and find the two tails. Adjust the tails so that the stitches are uniform at the join. Then I tie a square knot. I know lots of people say NO KNOTS. I've been crocheting a long time and have been doing it this way and have never had a crocheted item come apart. Okay, now you have a knot near the top of your work, use your hook to weave one tail in and out of the back loop of your work about six times. Weave the other tail the opposite direction, also in the back loop. End your weaving with the yarn tails on the back side. Now crochet away. When you come to the woven section on your next round, crochet right over it like it isn't even there. When you are all finished go back and trim off the little tails that remain. You won't be able to see the join, and it will NEVER come undone. This is a very nice set. Thanks for sharing. I had started a grogery bag holder for the kitchen that i tried to make but this is what i had in mind, thanks. 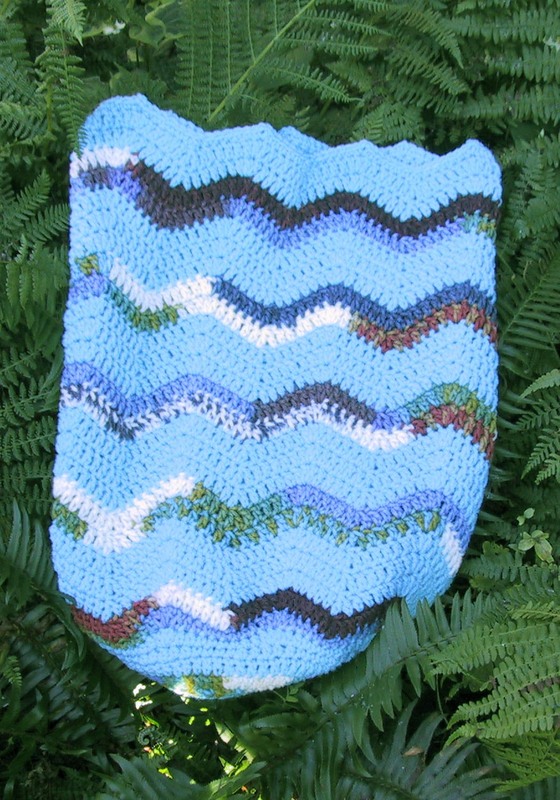 Also i never thought to make a nice little papoose, it's a great pattern! Can sport weight yarn be used for this pattern? It is softer than the ww yarn. I love your site and patterns. Thanks! With sports weight it will be smaller. Can I use a magic circle to start this off. I prefer a ring, crochet over the tail and pull the tail tight to close any opening. You can do what ever you want. I am not seeing where to change colors? Am I just missing it? Change colors when ever you like. I did three rounds of solid and two of the variegated. I am having trouble between row 9 & 10. 9 doesn't seem to have enough stiches for row 10. You should have 98 stitches on round 9 and all the rounds after that. It has been crocheted many times by many crocheters, so I am confident the stitch count is correct. I love this pattern but I did modify it. After row10 I worked back and forth so it would be open and easier to put baby in. A round of single crochet, button holes and buttons. The people I have given them to love them! You are an inspiration!